As a matter of fact, I haven’t seen the bottom of it for like 8 years. 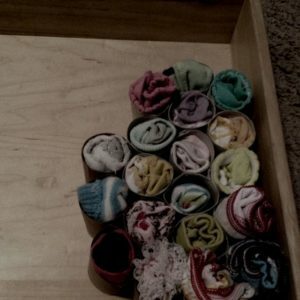 I never find the time to sort socks, match them, roll them up and put them away. The moment I sit down with to match them up, something (more important) comes up and I redirect. Good intention, bad follow through. 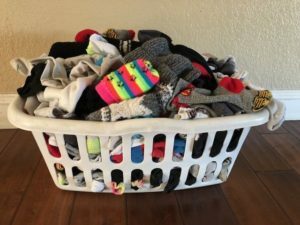 My kids search (or not) for matching socks in the morning and it can get hectic on the wild sock hunt when we need specific socks for things like sporting events. I’m boarding the shame train because I am not organized enough or disciplined enough to take the time to match all our socks. I have failed to teach my kids the proper way to do laundry. I dread that my “mom stock” may have dropped and my kids have suffered because of my inabilities. I have disappointed myself because I am not good enough. There is hope. 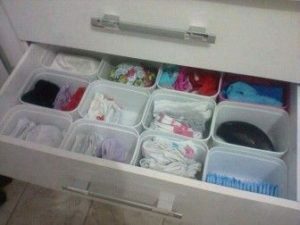 I could go on Pinterest and find hundreds of ideas on how to better organize my socks. 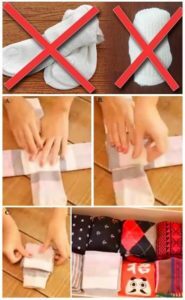 I could take the time to learn how to properly fold my socks the right way. 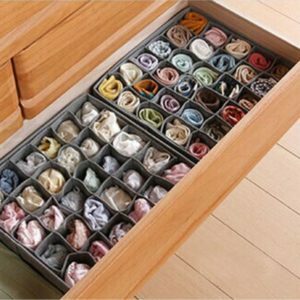 I could go one step further and install special compartments in all our drawers, so each set of socks has its own little home. 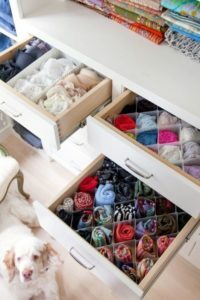 I could get creative and reuse toilet paper rolls or baby wipe containers as these brilliant, organized moms did to create special spaces for all their socks. 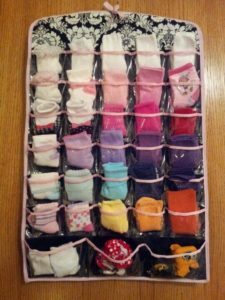 I could spend my time not only matching socks but then attaching them to these handy-dandy sock-holders that would hang in my ever-so organized closet (Disclosure, not quite the truth). Or I can just admit I would rather spend my time, money or energy on other things in life. I can be honest and say that I’m good with a messy sock basket and that it doesn’t define me. It’s a foreign concept to say, “I am enough.” It feels boastful, arrogant and vain. It’s uncomfortable to say it out loud for sure. We live in a society that tells us we don’t do enough, we aren’t pretty enough or ambitious enough and whatever we do, social media reminds us someone is doing it better. What an exhausting way to live. There is a tremendous amount of power in saying “I am enough.” And the power is in the period. Nothing needs to come after the period. Often people think I will be enough when… as if what we do equates to our value. We tell ourselves we’re not good enough, smart enough, or thin enough. We don’t make enough money, don’t have the right house, the right car, or the right clothes, and even if we did, we wouldn’t look as good in them as everyone else does. We tell ourselves that “I’ll be enough” when my kids get all A’s, or “I’ll be enough” when I can squeeze into those pre-baby jeans or “I’ll be enough” when I exercise every day for the entire month. Placing expectations on ourselves to do more or be more in order to feel like we are good enough is a destructive, tiring and painful cycle. But when the period comes after the word enough, we no longer need to do or be anymore than we already are. Saying “I am enough.” lets us embrace our imperfections and our flaws and reminds us that we are just doing the best we can. We may not be doing it all, but we all are doing something. This journey of being humans together is beautiful once we place that period. When we accept ourselves right now–full sock basket and messy bathroom sink, 15 pounds heavier than we want to be, face that shows our age, kids and marriage imperfect– our growth and our happiness will come from a place of wholeness, not a place of insufficiency and that is powerful. When you truly believe “I am enough.” you stop pretending and start praising yourself for all you actually do. When you truly believe “I am enough.” you focus on your capabilities instead of your inabilities. When you truly believe “I am enough.” you embrace your worth, not your worries. When you truly believe “I am enough.” you stop comparing and start practicing self-compassion. When you truly believe “I am enough.” you stop shaming yourself and start seeing your strengths and your value. When you truly believe “I am enough.” you stop attacking yourself and start affirming your personal gifts that make you exactly who you are. When you truly believe “I am enough.” you stop hurting and start healing. When you truly believe “I am enough.” you no longer strive to measure up and you can exhale. I am often reminded of the insightful words of Maya Angelou… “You alone are enough. You have nothing to prove to anybody”. Amen Maya. 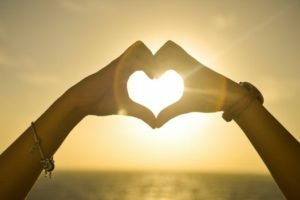 I challenge you to start treating yourself with love, self-respect, and significance. Take the time to nurture the things that make you unique. I can guarantee you this, there is something in you that sets you apart from everyone else. Find it and embrace it. To own your story means saying I have enough, I do enough and most importantly, I am enough. Period. I like that-I’m enough. I’ve said many a time – it is “hell” to grow old. But, I find I would not go back one year because “I am enough”. Thanks Kelly. Always nice to remind yourself. Your are doing great sister. Be proud. The kids won’t remember the pile of socks, but will remember you going to all their events, helping with homework and always being there for them.